This Broccoli Gratin with Swiss and Parmesan is a deliciously healthy option for a Thanksgiving side dish, and it’s low-carb, Keto, low-glycemic, gluten-free, meatless, and South Beach Diet friendly; use Thanksgiving Recipes for more Thanksgiving ideas, or check out the Diet-Type Index to find more low-carb recipes like this one. Click here to PIN Broccoli Gratin with Swiss and Parmesan. Broccoli Gratin with Swiss and Parmesan! I love, love, love Thanksgiving, and 2015 is the 11th year I’ve been sharing Thanksgiving recipe ideas on this blog. There have been some definite favorites along the way, and this Broccoli Gratin with Swiss and Parmesan is a dish I’ve made over and over for Thanksgiving. The recipe was adapted from one I saw in A Pinch of Salt Lake, a book published by the Junior League of Salt Lake, and I love this cheesy broccoli that’s definitely fresher-tasting and a bit lighter than the canned soup version of Broccoli with Cheese Sauce that quite a few people in my family still like. Broccoli Gratin with Swiss and Parmesan is low-carb and gluten-free, and if you’re looking for a more carb-conscious vegetable option for Thanksgiving, I think this recipe is perfect. Here are my picks for The BEST Low-Carb and Gluten-Free Thanksgiving Side Dishes, in case you’d like more ideas. And if you really like broccoli, look after the recipe for 10 more ideas for Thanksgiving-worthy broccoli, enjoy! Blanch the broccoli just two minutes minutes in boiling salted water, then drain well. Mix together grated Swiss cheese, mayo, lemon juice, Dijon, and finely chopped green onion to make the cheese topping. 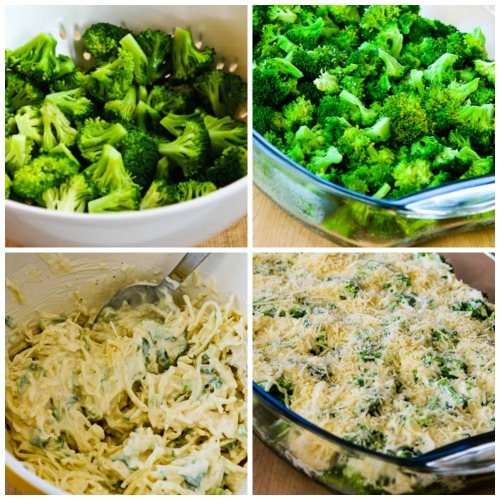 Put drained broccoli in a low-sided glass or crockery casserole dish, then spread the cheese topping over the top. Sprinkle the finely grated parmesan over the top. Bake about 30 minutes, or a little longer if you like it well-browned like I do. Serve hot. This recipe adapted slightly from A Pinch of Salt Lake. All the ingredients in this Broccoli Gratin with Swiss and Parmesan are low-carb foods, making this a better choice for low-carb diets than many traditional Thanksgiving vegetable dishes. This recipe is relatively high in fat which won’t matter to many low-carb eaters, but if you’re following The South Beach Diet, it’s probably a “once-in-a-while treat”. Use the Recipes by Diet Type photo index pages to find more recipes suitable for a specific eating plan. If you want nutritional information for a recipe, I recommend entering the recipe into this nutrition analyzer, which will calculate it for you. Or you can sign up for a free membership with Yummly and use the Yum button on my site to save the recipe and see the nutritional information. This broccoli gratin with swiss and parmesan looks so zesty and tasty! Absolutely love your creative idea! Thanks for sharing! Glad you like it; enjoy! I had tried many recipes with Broccoli.But this is something new to me! Pingback: Keto Diet Side Dishes for the Holidays. Ketogenic recipe round up! I am a huge fan of cheese veggie gratins. My family will love this broccoli version! Thank you for linking up to my recipe, Kalyn! My pleasure Anna, glad you like it! This is my first recipe using broccoli and it was really amazing! I also read below and tried using broccoli and cauliflower. Thanks a lot! So glad you enjoyed it! I need to try the broccoli-cauliflower combo! This was so good almost better than the skillet chicken cordon bleu I served with it!. We have started keto again this week. We were very successful last year losing 40lb each in less than 4 months. At 50 years old I became pregnant for the first time in my life. I went on to have two miscarriages in 10 months. As sad as that was regaining the 40 lb is a constant reminder. So heres hoping we are sucessful and can make a lifelong change from eating so many carbs. Oddly when I was pregnant all I wanted was carbs, crunchy carbs. I couldnt stomach most vegetables either. It has taken 4 months for me to get to the place where I could get back to eating vegetables and start to cook again. Easy successful recipes like this make my transition so much easier. I didnt have enough swiss cheese so I used mozzerella instead. But I will try the swiss and even cheddar to go with many entrees. Oh Michelle, so sorry to hear about that. I’m happy you enjoyed the recipe and that it can help you get back to healthy eating!! Is there anything you could substitute the mayo for? I am not a fan of mayo at all unfortunately. I haven’t tried it with anything else, but maybe sour cream would work. I can’t say for sure, but would love to know what you think if you try it. I haven’t done it, but I think you could cook the broccoli, drain well, cover with the gratin topping, and the cover and refrigerate and finish baking the next day. You need to let it come to room temperature before you bake, or add a little more time in the oven. Love to hear how it works, I can’t think of any reason why it won’t! I hate broccoli but in combine with Swiss cheese and Parmesan i hope it will be tasty. Thanks for sharing Kalyn! I had tried many recipes with Broccoli. But this is something new to me! This is a go to recipe for big family dinners. I use a combo of broccoli and cauliflower. I like that idea Lori! So glad you have enjoyed it. This looks really good! I'm just curious why you say 8T instead of 1/2 cup? Cici, who knows, but probably because I was increasing it to a larger size so I just doubled the amounts and didn't think to make the conversion. I haven't tried it with frozen broccoli, but I don't think it would be nearly as good. The frozen broccoli seems like it will get too soft in a recipe like this. You could try it with a shorter cooking time and see what you think. Can you use frozen broccoli? It's not in season here, yet. Thank you! Kit, so glad you liked it. I love the blend of cheeses you used! This was winner today at a church lunch. It was almost gone before I had a chance to get a serving. I used a combination of cheddar and Gruyere along with the Parmesan cheese. So delicious. Thanks for this great and simple recipe. Barbara, I haven't. I like the creaminess of "real mayo" mixed with light mayo. Have you made the recipe just using the light mayo?